Another recipe from our favourite veggie cookbook, Plenty by Yotam Ottolenghi. This is easy-peasy with fantastic results. A long list of ingredients but you may have some of the spices in the cupboard already and the vegetables are all in season so you should be able to pick them up for relatively cheap. We thought the olives weren’t really necessary so if you don’t have any you could leave them out. Heat the olive oil in a paella pan, or large shallow frying pan, and gently fry the onion for 5 minutes. Add the peppers and fennel and continue frying on a medium heat for about 6 minutes, or until soft and golden. Add the garlic and cook for another minute. Add the bay leaves, paprika, turmeric and cayenne to the vegetables and stir well. Then add the rice and stir for 2 minutes before adding the sherry and saffron. Boil down for a minute, then add the stock and 1/2 tsp salt. Reduce the heat to the minimum and simmer very gently for about 20 minutes, or until most of the liquid has been absorbed. Don’t cover the pan and don’t stir it. Meanwhile, pour plenty of boiling water over the broad beans in a bowl and leave for a minute, then drain and leave to cool down. Squeeze each bean gently to remove the skin. Take the paella pan off the heat. Taste and add more salt if needed but still try not to stir it too much. Scatter the tomatoes, artichokes and broad beans over the rice and cover tightly with foil. Leave to rest for 10 minutes. Take the foil off. Scatter the olives on top and sprinkle with parsley. Serve with the lemon wedges. You guys have been busy blogging. Beginning to feel like a right oul’ laggard. 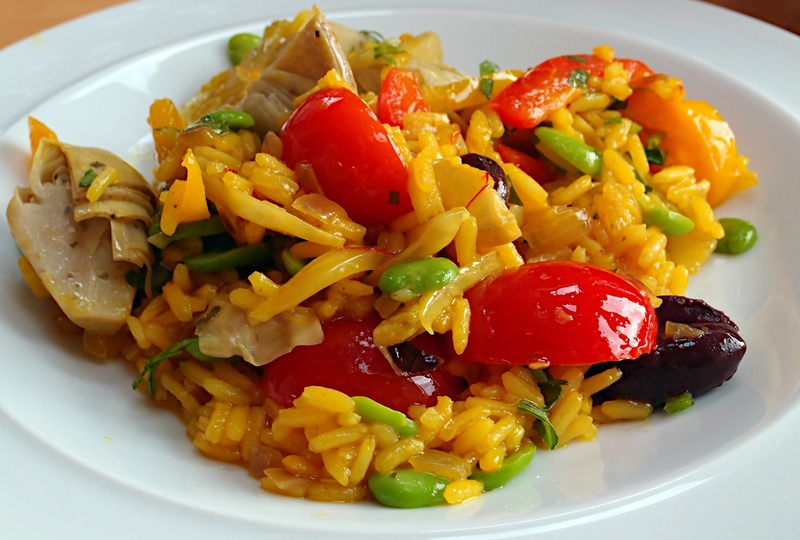 So glad you like both the recipe and the site; we love this paella too!